We live in a world where nuances matter. 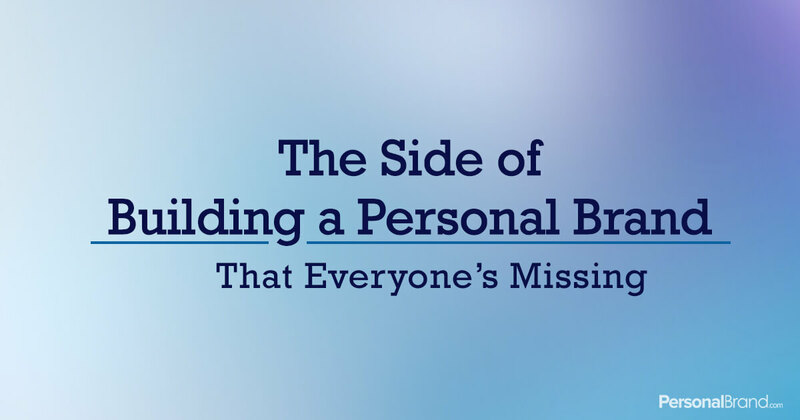 Personal branding is not the sole path to building a sustainable personal brand. It’s actually only half of the equation. Most people who talk about building a personal brand are really talking about the process of personal branding, and fail to talk about the most important part of building a personal brand. Today, Gurus, and other people talking about building personal brand, are really just talking about branding. They give tips like create a brand color scheme, select a brand font, get a professional headshot, design an authority website, share your content, etc. While those are all pieces of the puzzle, they are just that… pieces. Pieces that miss the entirety of what it actually takes to build a sustainable personal brand, to actually build a career here. Anyone can hire a photographer and a designer, share content on social, and create a stunning website that makes them look like a million bucks. But, if that was all that was required, then we would all just follow those steps and would all be massively successful. There are actually two sides of the coin that are both required to build a successful personal brand, that are often entirely opposite skill sets. 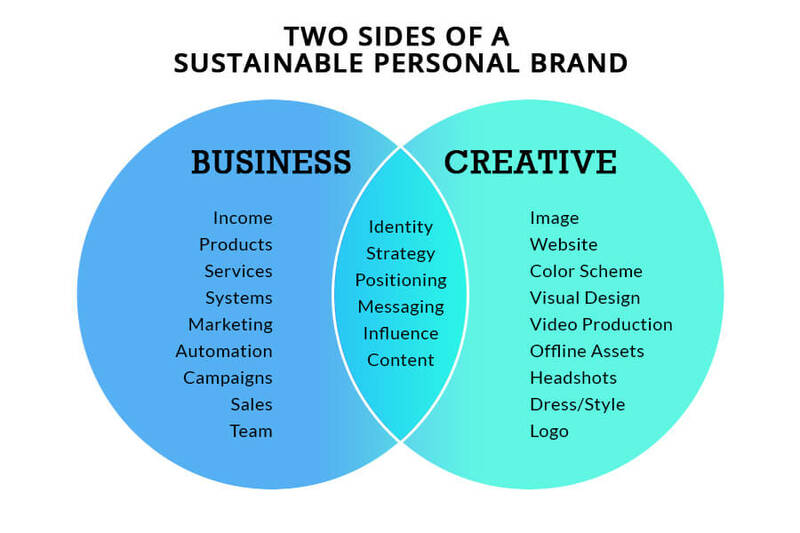 Those two essential parts of any personal brand are the Business half and the Creative half. Everyone else talks almost exclusively about the Creative side of personal branding, almost no one talks about the Business side of building a revenue mechanism, and a brand. That’s why we are so passionate about helping people like you, build a personal brand the right way. We believe that the purpose of building a personal brand is to create big income and an even bigger impact. We believe the two sides are indivisible and that they are not only linked, but completely dependent on one another. Without big income, your impact is limited. With big income, your impact is unlimited. Back to the personality brands. For two decades, people have primarily associated personal brands with celebrities and talk-show hosts. People like Larry King, Oprah, Johnny Carson, Martha Stewart, etc. These types of “personality” personal brands are deceiving because the revenue-generating mechanism (the business half), isn’t as obvious. You aren’t directly paying these people money to watch their show, and they aren’t selling any of their own products at the end of the show. So, where is the revenue? The personality is getting their paycheck from the advertising dollars. The revenue mechanism is advertising to the audience the personality attracts. Without getting too far into the weeds with that example, my point here is that ALL personal brands have a revenue generating mechanism, whether you can see it directly, or not – so your personal brand needs one too. Over the past decade, working with thought leaders, influencers, and personal brands at all ends of the spectrum, we’ve seen that the Business side is not only often overlooked, but it’s also the most important of the two sides. 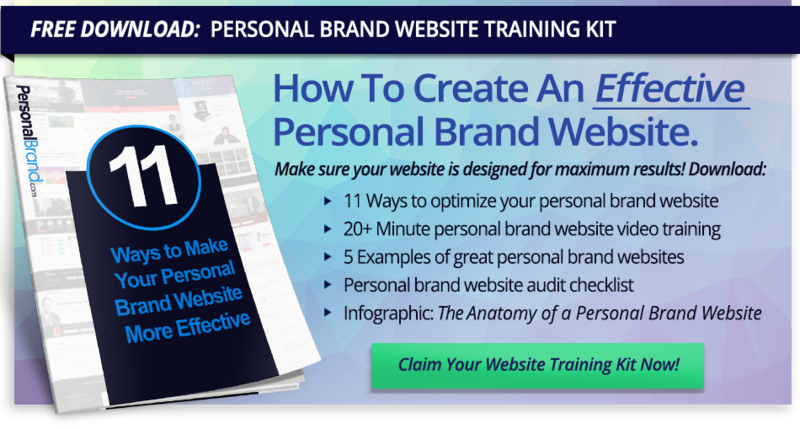 One of our private clients built an 8-figure personal brand empire with a homemade website built on Dreamweaver when they first got started. Thinking you need a pretty website before you “launch” your personal brand is not actually a reality. If your products and services are rock solid, you can have a subpar website and you’re going to be massively successful. If you just have polished headshots and a nice website, it’s going to be very hard to sustain your presence. You must consciously create your personal brand with both sides of the equation in mind in order to build a sustainable personal brand. Spend more time on the business side when you are just getting started, create world-class products and services, do things that don’t scale, get your hands dirty, and you’ll learn everything you need in that process to build an empire.